Fr. Lang takes on the difficult question of sacred signs in our liturgy and sacred arts in his book Signs of the Holy One. It’s an excellent book and I strongly recommend you read it. Copies are available on Amazon here. In the classical philosophical tradition, signs are either natural or conventional. Smoke is a natural sign of fire. Language is a conventional sign; what is called “dog” in English might just as well be called “chien” or “canis” or “hund” in another language. What is signified by these signs depends on the agreement of a certain group of people. Tools, like words and other conventional signs, are means to accomplish certain tasks. My grandfather would always remind me that a chisel is not a screwdriver or pry bar, even though they have a similar shape. 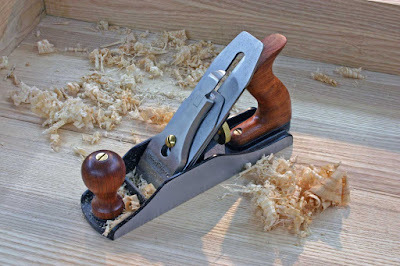 Similarly, a wood plane is not a paint scraper. The more specific or important the task, the more “sacred” or “set apart” the tool. He was a master woodworker and engineer, who had countless patents at Eastman Kodak, as well as numerous gorgeous Williamsburg reproductions he made in his basement workshop. I learned over the years that his methods and ways were not haphazard, but were rather the seamless fusion of art, craft, and science. If I wanted results like his, imitation and humility, not innovation, were the first steps. I say the topic of sacred signs is a difficult question, because the meaning of all conventional signs, is, well, conventional. The meaning of words, for example, is shaped by what people think the word means. Just ask my second cousin, Gay. What means something in one age and place can come to mean something entirely different in another. Carpet bags, which were a fashionable purse in the northern United States at the time of the American Civil War, became a sign of Northern greed and aggression as they were carried south by eager schoolmarms during the Reconstruction Era. What was just a purse became a sign of a complex socio-political reality, a shibboleth. What is insignificant for one person may be highly significant for another, according to their knowledge and background. How does this issue of changing signs relate to our liturgy and our faith? Church architecture and other sacred arts, says Fr. Lang, are different from “spiritual” art. What is spiritual reflects the personal, individual experience of the artist, but what is sacred must be a means for others to reflect on a revealed, universal truth. As such, the object or goal of the sacred arts is to reveal or teach about something that is a fixed part of the Christian, catholic, apostolic tradition. Ultimately that tradition must be at unity with itself... the one, holy, catholic, and apostolic church is founded on one Lord and Savior, Jesus Christ. In other words, because sacred art serves public, didactic purpose (as opposed to “spiritual” art), it must be timeless and universal. It’s both a sign and a tool. Sacred arts and architecture are tools with a purpose. To that end, Fr. Lang reminds us of Pope Benedict’s words about architecture: “The very nature of a Christian church is defined by the liturgy.” Little details become really important here. Consider the chant for Christmas morning, Mass at Dawn: “Lux fulgebit hodie super nos… - Today, a light shall dawn upon us.” If our parish church is built with the altar facing East (according to the Tradition), people attending Mass early Christmas morning will literally see the sun dawning through the sanctuary windows as the chant is being sung about the “Son” dawning. Not only that, in the weeks and months following Christmas, the days begin getting longer. Christ is indeed the light of the world. This is the richness that comes to life when we are faithful to our own tradition, when we use a chisel as a chisel, and not as a screwdriver.